Like all structures, silos degrade over time. This natural and inevitable deterioration can lead to safety hazards such as falling debris, leaky structure, fire or explosions, wall failure, roof failure, and/or structural failure. Unaddressed or unknown silo issues jeopardize the quality of stored materials, structural stability, nearby equipment or structures, and personnel. While accidents happen, many risks involved with silos can be avoided through the adoption of a routine inspection and maintenance schedule. 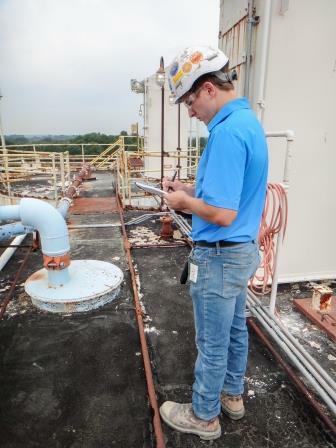 Proactive silo inspection helps ensure continued, safe operation. Common issues include various roof issues, wall cracking, material buildup, and cone issues. Frequent, regular observation of the whole silo structure is the best way to catch potential problems early and avoid possible safety issues. While professional inspections are recommended every two to five years, unless there are structural or operational concerns that would necessitate more frequent inspections, there are numerous areas that you should inspect in-house on a regular basis. Roofs are an essential part of the silo structure. During in-house inspections, you should look for signs of cracking or peeling in the roof-top coating. Leaking roofs can lead to contamination of stored materials that impacts product quality. Water penetration also leads to corrosion of metal silo components like roof beams – an issue that can lead to total roof failure if not addressed. Roof beams are a frequent area of corrosion, often due to roof leaks. Spalling, or flaking, of concrete on roof beam pockets can further expose beams and increase the chance of roof failure or collapse. You should also look for signs of pooling, or ponding, water on the silo roof. Regular pooling that sits on the silo roof lowers the lifespan of coating membranes and can lead to deterioration and leaks. More seriously, ponding water is usually caused by issues with the roof beam that supports the roof and can indicate potentially severe structural problems. Left unaddressed, these issues become costlier to correct and increase liabilities. Though concrete is a superior material for the construction of storage silos, normal loading and unloading operations can lead to structural issues over time. Cracks in silo walls, linings, roofs, and foundations are an indication of stress. Concrete walls that show horizontal, vertical, or diagonal cracking may be an indication of delamination, or separation of the concrete into layers. A serious issue, delamination of silo walls can lead to wall failure or collapse and should be addressed by a professional silo repair company immediately. Corrosion of metal silo components, exposed rebar, or other deterioration like spalling should also be noted during a visual inspection. In-house inspections should include verification that preventive maintenance measures are being followed. Silo maintenance should include regular checks of air flow units, a routine professional cleaning, and regular, complete silo emptying. Of these measures, one of the most important is the regular emptying of silos. Silos that are regularly emptied and refilled are less likely to experience buildup issues seen in those kept topped off. Regularly emptied silos need professional cleaning less frequently in comparison. They are also less likely to experience issues like compacting and hydrating. Hydration occurs when moisture mixes with stored materials and causes them to solidify within the silo. When this happens, materials can expand and cause added wall pressure which increases the likelihood of structural failure. Lime and cement are highly susceptible to compacting and hydrating respectively. Though frequent inspections should be conducted in-house to catch warning signs early on, it is important to understand the accompanying limitations. Many serious issues can only be identified by experienced silo inspectors or silo engineers during in-depth examination of empty silos free from material buildup. 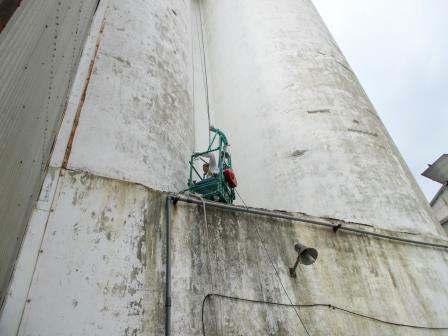 The routine examination of your silo is only effective in increasing facility safety and ensuring smooth operations when it is conducted in conjunction with professional inspections as part of a regular preventive maintenance schedule. When used in place of professional services, in-house inspection, cleaning, and repair procedures increase safety risks. Failed silos can sometimes be repaired and some stored material can be recovered. However, companies often face additional costs from cleanup, possible environmental damage, injury, or loss of life. Both of these accounts demonstrate preventable accidents where the necessary confined spaces permit was not held and the decedents did not have the necessary safety training. Confined space permits and safety training are essential for safe inspections. 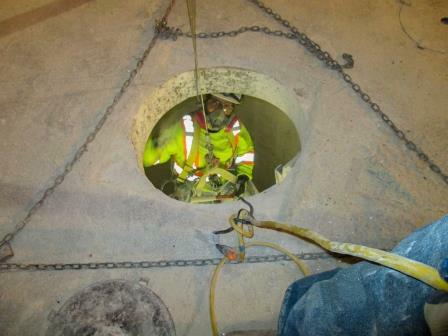 While there are no inspection recommendations specific for silos, OSHA does have policies regarding confined space entry that are essential for interior inspections. The effective inspections, however, depend on more than this permit. Inspectors must also have field experience and an understanding of the unique properties that effect silo material flow and structural integrity. Industry experience further enables trained silo and bin inspectors to determine predictive maintenance to address issues before they become real problems. Effectiveness and safety therefore rely on industry experience and proper silo engineering, design, and construction training. The biggest limitation of in-house silo inspections is the lack of specialty training in the design, construction, and engineering of silos. In-house inspectors are not familiar with the nuances of silo construction. Experience with design and engineering aspects of steel and concrete silos is critical for safe and effective inspections. Silo discharge cone issues are a prevalent problem that is easily preventable through routine inspection and maintenance. However, inspections of silo cones should be left to professionals as the construction, design, and use need to be considered based on stored materials, current best practices, and material flow. A professional inspection can conduct thickness testing and identify potential issues with existing cone designs. Cone construction and design both effect the safety and performance of your silo. Storage and flow are effected by the cone shape and the stored material type. Silos constructed with a suspended cone are no longer recommended as they have a high failure rate. Existing silos that use a suspended cone design should be remediated by a professional design, construction, and repair company who can reinforce the cone to create one that is supported from underneath following best practices. Roofs can experience a number of problems, some of which risk structural integrity. Buildup on the roof adds additional weight that goes beyond the maximum capacity. This can overload the structure and cause a collapse. Damaged roof beams can also lead to structural failure of silo roofs. In addition to these major issues, the surrounding curb section, which sticks out approximately 4-6 in. from the roof, can break away in some cases and strike people or other buildings below. Buildup in the silo is an indication of ratholing and potentially asymmetric flow, which can increase pressure loads inside silo walls. When you have buildup in the silo, the loads associated with asymmetric flow can be detrimental to the structural integrity of the silo as they can lead to wall failure and total silo failure. It is important to understand the particulars of silo design in order to correctly identify causes of material flow issues. Addressing these issues in-house or inspecting silo interiors without experience or necessary permits can increase safety hazards and lead to liabilities and litigation. Inspections can uncover problems that require immediate remediation. The most important thing to remember when conducting in-house silo inspections is to consult a professional silo inspection and repair company if you discover anything alarming. You should also defer to a professional inspector if you do not have personnel with the necessary permits for closed space entry. The benefits of a professional silo inspection every two to five years far outweigh initial costs as they increase safety, lead to better production schedules with no unplanned downtime, and help prevent litigation from unaddressed safety issues. Preventive maintenance is also far more economical than major repairs from structural failures or rebuilds. As experts, third-party inspectors should come with an established history of safe operations, as well as the appropriate permits for confined space entry and engineering experience so they understand the unique properties of silos and your contained materials. Dennis Blauser is the CEO of Marietta Group, which houses Marietta Silos, Marietta Inspection Services, and USA Silo Service. Marietta Group has spent over a century meeting the needs of industry professionals and provides engineering, design, construction, inspection, repair, and maintenance, in addition to silo and bin cleaning. For more information, visit www.askmrsilo.com/resources.